Ahoha! 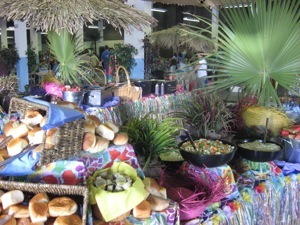 Try a Top Notch Hawaiian Luau for a taste of the tropics. Enjoy grilled teriyaki pineapple chicken from the Island Buffet, sip some tropical fruit punch and relax to sounds of the steel drum band. 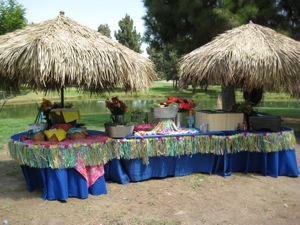 Every detail of the Top Notch Hawaiian Luau is carefully coordinated from the color of the linens and umbrellas or canopies to the flowers, Hawaiian props and staff uniforms. Of course, all of your guests receive Hawaiian leis. 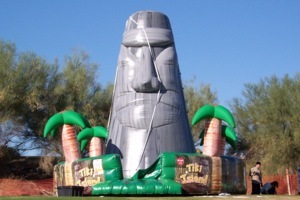 Complement your Hawaiian Luau with a dazzling Polynesian dance troupe or the giant Tiki Climbing Mountain. "The event went off like clock work and was extremely enjoyable. It was an amazing day."